When it comes to Eco-Adventure Tourism; Elkhorn City has it all! So Let’s Get It Done! This is a guest post by my friend Hunter Doerr. He wrote this as a response to my last post Our deepest Fear? Elkhorn City can be Powerful … Beyond Measure! A Mini Manifesto on Economic Development in Elkhorn City, Kentucky. As a kayaker and backpacker I’ve had the luxury of traveling to some really neat and amazing places. Some of which you mentioned above. Last time I was at theNantahala Outdoor Center (NOC), I took off after work with a friend and drove the 4 hours to purchase a new kayak. While there we were dining in a really cool little restaurant over the river, it hit me. I’ve said along that Elkhorn City could be great, and we have discussed the possibilities for Elkhorn City, but sitting in this restaurant it really hit home. There is about a three hundred yard section of river that has been slightly tweaked to make the whitewater a little more ‘fun’. As we were eating we saw everything from a father teaching his very young son how to sit in boat, to advanced kayakers having a blast on the whitewater course. This change to the river is now the reason they host several national playboating competitions that bring in people from all over. The river flows under a bridge (almost identical to Elkhorn City’s layout) on either side of the bridge is the Nantahala Outdoor Center (NOC), on the other side are the rafting companies and several places to stay the night. Everything from primitive camping to a nice cabin. As you drive upstream to the ‘put-in’, you pass at least 10/15 rafting companies that do great every summer and stay booked with business. There are more restaurants and shops along the way as well. Sitting in this restaurant it really became apparent that not only can Elkhorn City do the exact same thing, but it’s crazy it’s not in progress already. We have everything the NOC has and even more in my opinion. 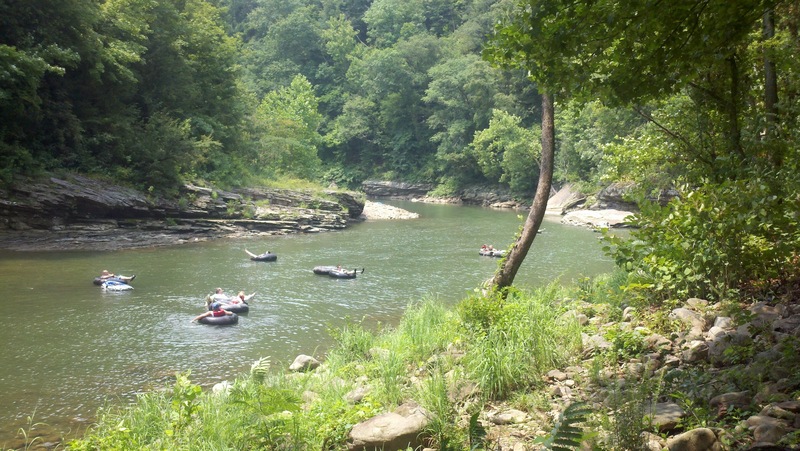 The Russell Fork has it all, flat water activities like canoeing, and fishing. There is also some of the best whitewater in the country about ten miles upstream from Elkhorn City that people already travel to from other countries because of its beauty and challenge. Below that is a beginner/intermediate whitewater section as well. It’s like going to ski resort and having your choice of hitting the greens, blues, or blacks!! I really hope I am still around when Elkhorn starts to morph into one of these great little towns where the locals should be proud and share the towns attributes with everyone. Lets get on it!!! One of the greatest challenges that we face as a community in Elkhorn City is the fear that we as a community are powerful beyond measure. The above quote from Marian Williamson not only applies to individuals but it also applies to collective groups. I’ve struggled with trying to build Elkhorn City for over 15 years through the Elkhorn City Are Heritage Council which is a non-profit whose mission is to protect and to preserve the heritage of Elkhorn City and to promote eco and adventure tourism in Elkhorn City. It is almost a cliché at this point that Elkhorn City has so much potential. The favorite quote I always hear is “Elkhorn City can be another Gatlinburg.” It is true we could be another Gatlinburg … we could be a lot of things ,we could be one of the greatest tourism towns in the Commonwealth of Kentucky bar none. Elkhorn City has all the natural assets that it takes to attract visitors to our community to enjoy the mountains, the river, the trails, and the unique heritage that we have as the people. But we as a community has always been afraid that if we do build it they will come and what if they do what will we become. The quote about Gatlinburg is always amusing to me because I’ve never wanted to be another Gatlinburg I wanted to be Elkhorn City Kentucky. Gatlinburg is crowded and congested and grew at a pace that should have been a little more thought out and a little more slow. The one thing we can learn from the growth of Gatlinburg as a tourism town is that Gatlinburg grew because it was a trail town it is located at the beginning of the Great Smokey Mountains National Park it was a town that catered to people who wanted to go into the smokies to hike, fish, bike, and enjoy nature. That is what started Gatlinburg’s upward climb to a booming economic community. Elkhorn City also has great natural assets that it sets right in the middle of, no we don’t have a National Park but we’ve got the Breaks Interstate park which is a totally unique and gorgeous park the grand canyon of the south, the Russell Fork river, the pine mountain trail, the new great eastern trail which is going to be coming through Elkhorn city, the trans America bike trail which already runs through Elkhorn city. We see growth and visitors right now on a small level but, there are things we need to do as a community to enhance their experience and to attract more people and we can do it nice good clean intelligent ways that will bring prosperity to our community and the economic growth that we need. Elkhorn City needs to be an original. In the world of music there’s an old saying that cover bands don’t change the world only original bands do. Perhaps are greatest challenge when you say we could be another Gatlinburg we don’t want to be another Gatlinburg we don’t need to be another Gatlinburg we need to be Elkhorn City. But that doesn’t mean that we do not look for the positives and the negatives regarding the Gatlinburg story and how they became a trail town. It also goes back to the point I made earlier, that we are powerful beyond measure and that’s probably our greatest fear as a community is that we could be “another Gatlinburg” I know that’s one thing that scares me to death because I don’t think we should be another Gatlinburg but we should take some of the positive things that were done in Gatlinburg and learn from them and don’t go the negative ones. For instance, the new US 460 is coming along we need to do our downtown development in a nice quaint way that is inviting for a person to come downtown and spend a few hours that is not hectic, that is not loud, that your time in Elkhorn City flows just like the river with quaint shops and quaint things to do. Elkhorn City’s greatest asset is that all the trails (Pine Mountain, Great Eastern and Trans-America) lead into the middle of the town. Can we grow in other aspects in what I call the noisy way Gatlinburg did? Sure we can, we have annexed all the property along US 460 so we can grow we can take that kind of growth and put it there and become a unique quaint downtown that attracts the cultural heritage tourist and the adventure tourist and the trail user. The trail user right now is our most important demographic for bringing new money into the city. I myself has personally observed so far in 2012 483 bicyclist along the trans American trail and I observe them when I’m eating at one of our local restaurants, that means there eating there too, and they are usually spending about 10 dollars a head, according to the information that I have from the owner, so its easy to do the math on what kind of impact that trail has on that restaurant. And you also have to understand that I didn’t see all the users on the trail some came through, I missed some, and some did business other places. Right now the only businesses that are capitalizing on our trail users are our restaurants but there’s other ways that other retail businesses can capitalize on the trail users. Take a look at Sheryl Ramey’s recent blog post on my blog about how she came back to town as a tourist and wanted to spend some money on items from her home town that she could take back and show her friends, whether it be trinkets or any number of things. Not one of our retail businesses had any Elkhorn City souvenirs! 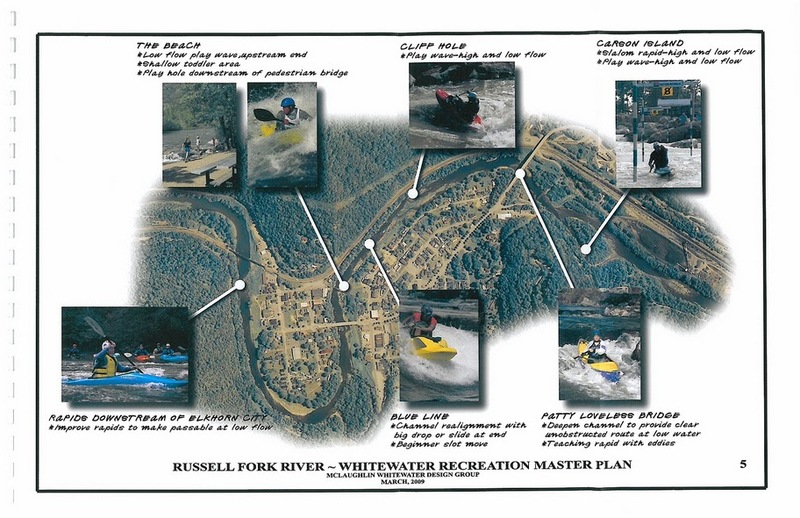 One of the most important things we can do as a community is develop the Elkhorn City Area Heritage Council’s, Russell Fork white water play park initiative in downtown,(link) which is a project which will go in and improve the river from a river users prospective from a kayaker and a paddler prospective and from a tubers prospective. There’s six specific places downtown where the river can be tweaked in a safe way that would promote more boaters to boat the section of river that is downtown and make it more exciting and thrilling for them. We know from a host of other communities who have done similar projects that the economic impact of white water parks in the downtowns can be anywhere from 1 million dollars a year up to 10 million dollars a year. We know that for every boater that are in these white water parks there’s usually 10 to 20 people who are observing them so that would create a wonderful opportunity for more people to be spending time downtown which opens up all kinds of potential for new business in the downtown area whether it be coffee shops retail businesses any number of things. We can also look at development of the river from the prospective of a business development the Nantahala Outdoor Center (NOC) established an outdoor recreation company located at the intersection of the Appalachian Trail and the Nantahala River in rural Swain County, North Carolina, that has proven to be a shining success story. Originally a roadside inn, the company has evolved into one of the largest recreation companies in the nation and one of western Carolina’s largest employers. In 2010, NOC contributed $85,386,489 to the local economy while providing a total of 1,061 jobs. Another successful eco-tourism example is nearby Damascus, Virginia where 20,000 people hike into town for the annual “Trail Days” celebration and if we do things to improve our river and improve our trail systems and improve the users we can have a business or businesses that have just as much economic impact on our community and we’ll raise the quality of lives for all the residents it would raise property values enormously and help us through hard economic times. Adventure Racing makes its debut in the area by testing racers over a grueling 15 hour course. Elkhorn City, KY. April 13, 2013: Racers from across the U.S. compete in a challenging event beginning at Breaks Interstate Park. Over the 15 hour course, racers will run, bike and paddle all while using a map and compass to find their way through some of the toughest terrain the area has to offer. To complete the event, athletes will push themselves over 65 very challenging miles. The Breakdown Adventure Race is bringing a collection of extreme athletes to the area imposingly dubbed, “The Grand Canyon of the South”. Starting in the immense and spectacular gorge area of Breaks Interstate Park, along the Kentucky/Virginia border, racers will begin an adventure with miles of mountain-high biking, scenic backcountry, and clear, gorgeous waters. For some, the goal will be just to reach the finish line, while others will be competing to qualify for a spot at the USARA National Adventure Racing Championships. As a never-before raced venue, the inaugural Breakdown will hopefully introduce racers to what the area has to offer, and will grow each year with some really exciting prospects on the horizon. The action begins the weekend of April 13, 2013. This is a guest post by James “Fred” Stapleton about the Great Eastern Trail thru Hikers that made it to Elkhorn City yesterday. The Great Eastern Trail is going to be a great thing for Elkhorn … heres Fred! Another historic day has come and gone in Elkhorn City, KY. The world renowned “Hillbilly Bart and Someday Jo Show” arrived safe and sound at the northern terminus of the Pine Mountain State Scenic Trail section of the Great Eastern Trail on March 11, 2013. I must say this show was spectacular! Definitely the best show in town, any town! In case you are wondering what the “Hillbilly Bart and Someday Jo Show” is all about. It’s all about the Great Eastern Trail (GET) and its first two thru-hikers, Joanna Swanson a.k.a. “Someday” from Minnesota and Bart Houck a.k.a. “Hillbilly Bart” from West Virginia. Like truck drivers, long- distance hikers have a “trail handle”. Unlike truck drivers, long-distance hikers are on a much slower pace and they carry their cargo (25-45 lbs) on their backs. 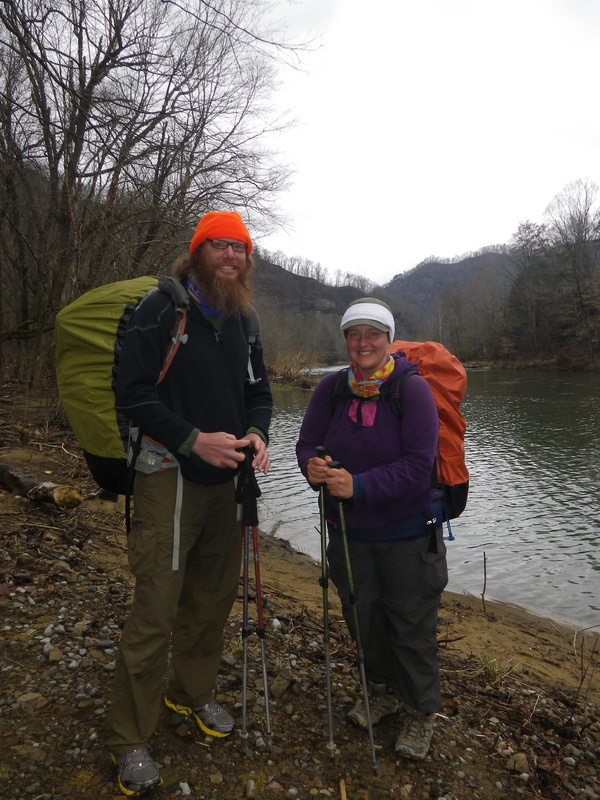 Bart and Jo began their epic journey in January on the southern end of the trail in Alabama and expect to be in New York’s Finger Lakes region sometime in May or June at the northern end. The Great Eastern Trail (GET) is America’s newest long-distance hiking trail which is 1800 miles long and crosses nine states. Originally called the Western Appalachian Alternative, it was conceived by Earl Shaffer, the first Appalachian Trail thru-hiker. The Great Eastern Trail (GET) provides a premier hiking experience on a series of existing trails that are being linked to each other into a long-distance footpath in the Appalachian Mountains stretching from Alabama to the Finger Lakes Trail in New York. Kentucky’s newest state park, the Pine Mountain State Scenic Trail is now officially part of the GET system and this is good news for Pike County. 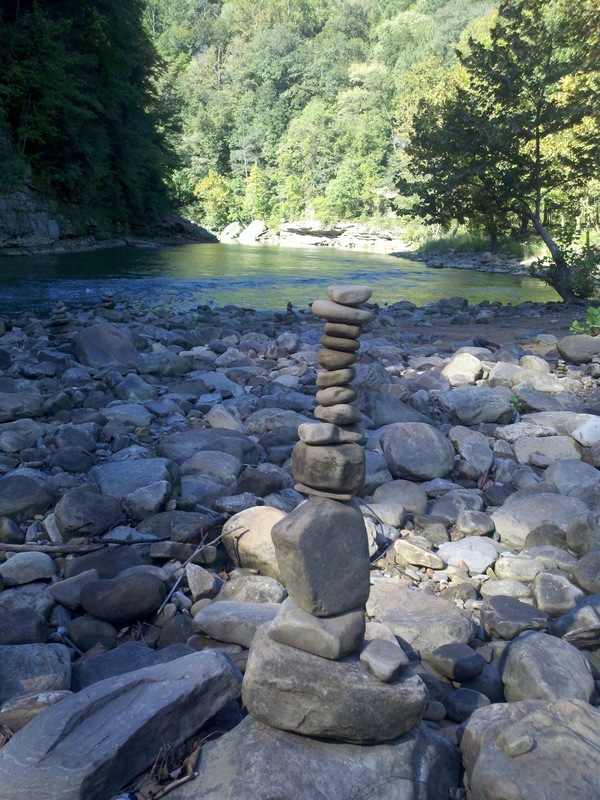 The Pine Mountain/Russell Fork River Corridor of Pike County Kentucky is quickly becoming an international destination for high-end eco-tourism activities. Undoubtedly, areas of Pike County such as Elkhorn City are poised to reap the benefits of this potential adventure recreation industry. For example, in 1972 the Nantahala Outdoor Center (NOC) established an outdoor recreation company located at the intersection of the Appalachian Trail and the Nantahala River in rural Swain County, North Carolina, that has proven to be a shining success story. Originally a roadside inn, the company has evolved into one of the largest recreation companies in the nation and one of western Carolina’s largest employers. In 2010, NOC contributed $85,386,489 to the local economy while providing a total of 1,061 jobs. Another successful eco-tourism example is nearby Damascus, Virginia where 20,000 people hike into town for the annual “Trail Days” celebration. I certainly think good things are on the horizon for communities that invest in eco-tourism but not all the benefits will be from financial gain, as I was privileged to witness Monday evening when I met “Hillbilly Bart” and “Someday” at the Pine Mountain Trailhead in Elkhorn City. This marked the beginning of “The Hillbilly Bart and Someday Jo Show” and I was fortunate enough to have the honor of rendezvousing with them at the Pine Mountain Trailhead and even more fortunate when they agreed to use my garage apartment, for a night of well deserved rest off the trail. “Someday” and “Hillbilly” were glad to get a solid roof over their heads (instead of nylon) and a hot shower. As for me, I was proud as a peacock to share my humble home with these celebrities. It was great to share their experiences over dinner at the Rusty Fork Café and again over my own, world famous oatmeal the following morning. I’m not sure who receives the most enjoyment on this type of journey… the backpackers or local folks like myself, whom they meet along the way. When I met “Sometime” and “Hillbilly Bart” Monday evening I essentially became part of their journey. I became a team member and began to feel their excitement, their anticipation of what lies ahead, the dread of an approaching storm and the joy of finding out they have reached a safe campsite for the night. This experience has made me think of the true advantages of living in a “trail town” or a “river town”. Throughout the ages humans have followed trails and rivers to advance trade… and trade advances prosperity and culture. So, just living near a river or a trail exposes us to new people, with new ideas that will enhance our knowledge and quality of life through diversity. As Jo and Bart are approaching mile 700 on their 1,800 mile (4-5 month) trek from Alabama to New York on the newly developed Great Eastern Trail, I have no doubt they will arrive in New York with smiling faces, a few blisters and a pocket-full of Smarties. I’ve learned that Smarties and Moon Pies are like some-kind-of redneck Power Bar for thru-hikers. I would have never known! If these folks stop in your town don’t miss the show. It’s certainly worth the price of admission…just for the nutritional info alone. Seriously, if you are fortunate enough to encounter these adventurers on their journey, offer your assistance and what you will receive in return will stick with you forever. In conclusion, I am happy to report that I returned “Hillbilly Bart” and “Someday” to the trailhead where I found them this morning and they are now on their merry way to Matewan, West Virginia with great enthusiasm and spirit, along with “Hillbilly’s” bum ankle and “Someday’s” blistered foot. My advice…don’t bet against these guys. Personally, I’m betting the bank that the famous “Hillbilly Bart and Someday Jo Show” will be playing at a campsite somewhere in New York soon!!! To join in the fun and follow the adventures of “Hillbilly Bart” and “Someday” on their way to New York visit their website at http://www.gethiking.net. Go, Go, Go Bart and Jo. 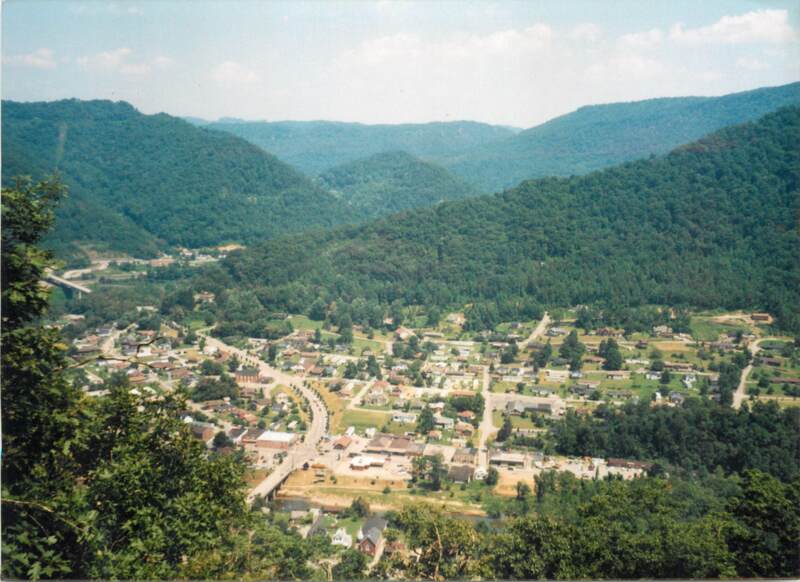 The author is a member of the Board of Directors of the Pine Mountain State Scenic Trail and currently living the dream in Elkhorn City, Kentucky. I enjoy keeping track of Elkhorn City’s blossoming tourism industry. The past couple of weekends I have been going by the Ratliff Hole River access and looking at all the license plates from different states and counties. On Saturday July, we had visitors from as far away as Utah and a minanite family of 8 from Indiana. There were also tourists from North Carolina (3 cars), Tennessee (2 cars), Michigan (4 cars), Ohio (3 cars), and in state tourists from Fayette county, Knott County, Perry County, Lawrence County and Letcher County. What is amazing is that I saw all these license plates at the Ratliff hole river access and only 2 or 3 of the cars where boaters. Everyone else was swimming and Tubing the river. My count of the people at 1:00 was 78 in or by the river. The river is getting just as much use during the low water in the summer as it does during the October Whitewater releases. Since I am a frequent guest of many of our local eating establishments, I also see the impact these visitors have on our local economy. All the restaurants in Elkhorn City have been busy. Another positive this summer for Elkhorn City’s local economy has been the water park at the Breaks Interstate Park. I have observed numerous families eating at the Rusty Fork Cafe in the late afternoon after spending the day at the water park in the Breaks. This is really a lesson in economics. I remember when the water park at the Breaks was being planned and a lot of people in Elkhorn City thought that it would not help Elkhorn City. Yet, it has helped. One way it has helped is to provide about 14 local jobs. I know of 8 young people who have jobs at the water park this summer. You also know it helps when you see 4 different families eating at the Rusty fork Cafe who have just came from the water park and are on their way home to Pikeville and Prestonsburg. I also should mention our visitors who come through Elkhorn City along the TransAmerica Bicycle Trail. My Count so far this year is 476 and that is just the ones who I saw, so we know the number is higher. Where do we go from here? We must complete our Trail Town Certification (link to Kentucky Trail Town Document) and make Elkhorn City’s tourism infrastructure more user-friendly. I talk more about ways to do this in future posts. For now get out and enjoy the river!